If you have been reading my posts, we have entered the second week of the month long 'Explore the flavors' series. This week it will be all about 'No Onion No Garlic' recipes. I know a lot of people who get lost when they have to cook without onion and garlic for whatever reasons. I have grown up in a family where garlic was never used and onion was sparingly used (still the same in my mom's place). So for me, cooking without onion and garlic is second nature. After I got married, it took me a few years to get used to the smell and flavor of garlic. Now I can cook with or without garlic based on the need :). There are still some dishes in which I cannot imagine adding garlic. I shall showcase some dishes which can be prepared without onion and garlic. I have already posted Dal Makhani - Low Fat version. Let us check the classic Punjabi dish in the No Onion No Garlic version. Wash the dals and set aside. Soaking is optional if cooking in the IP. If there is time please soak for at least a couple of hours. Puree the tomato and set aside. Power on the Instant Pot to 'Saute' mode. Once the display changes to 'Hot', add butter and cumin seeds. After the cumin seeds crackle, add ginger and saute for a few seconds. Add in salt, ajwain, turmeric, cardamom powder, garam masala and red chili powder. Saute for a few seconds and pour in the tomato puree. After it is cooked for a couple of minutes, add cashew cream, milk and the washed dals. Pour in about 4 cups of water, mix well, cover the lid and make sure it is in 'sealing' mode. Cancel the 'Saute' mode. Press the 'Bean/Chili' mode (45 minutes) and walk away. After the the pressure is released naturally, open the lid, cancel the 'warm' mode and set it to 'Saute' mode. Sprinkle kasuri methi and garam masala. Let it simmer for 5 minutes. Power down the Instant Pot. Garnish with coriander leaves. Serve warm with rice and/or naan and yogurt. Wowwing here Harini, how delicious this nutritious Dal makhani looks eventhough its doesnt have onion or garlic. And this ultimate dish will defintely please my tastebuds. Dal Makhani looks so good, Harini. Never tried dal makhani without onions before, will give a try on sometime. Looking forward to your other no onion no garlic recipes. Your version of dal makhni sounds rich and is a life saver on festival days. We used to cook without onion and garlic for a few years and never found it difficult to make such recipes. Even I started using onion and garlic only after marriage and it took some getting used to. This version of dal makhani is so good and that is a delicious spread..
That's a lovely theme to do Harini and your presentation rocks..I love Dal Makhani and I am sure going to bookmark to try later! I love the low-fat version of this dal makhani and still in my inlaws place they use onion and garlic only on Sundays as long as it's not amavasai and all that. Good to know all the no onion no garlic versions as well. 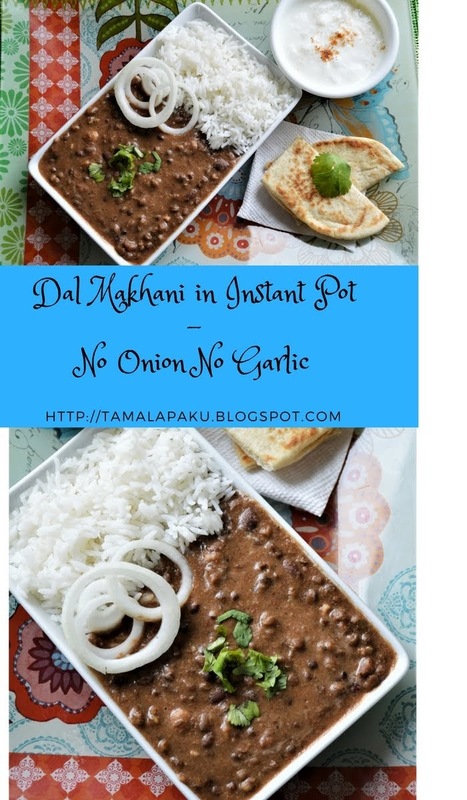 Good to see this low fat version of dal makhani, Usually from the creamy fat loaded version this is way better.We will never miss onion and garlic in this..
Super recipe of Dal Makhani, and simple yet catchy presentation of the dish. Can you believe I have never added onion and garlic to this daal, which is generally loaded with these two ingredients. I love such simple yet exotic meals. Same pinch Harini. Onion was sparingly used and garlic even more rare and that too only in rasam and only for me as that was one of my fav. This dish looks very tempting and the whole set up look delicious!! Even I was born and brought up without onion and garlic and after marriage, I used to vomit all over just by the smell of cooked garlic but now habitual of cooking and eating it. Dal makahni looks so creamy and tasty. What a beautiful looking dhal makhani this is and the best part is it is onion and garlic free. Would love to try this for one of the vrat days. That is one delicious dal makhani harini! my elder one's favorite side with rice, looks rich and creamy! Harini for years I've cooked everything without garlic and onion as my mother in law is an ISKCON devotee and they don't use garlic and onion. I now use garlic and onion in almost everything as she has moved to India. I like the idea of adding kauri methi to the dal to bring on the added flavor.